5:00 Alfond Auditorium. Program Begins. Bob Frishman, Symposium Chairman. 5:45 John Wilmerding, Sarofim Professor of American Art, Emeritus, Princeton University. 1:15 Meeting, Antiquarian Horological Society, American Section, ALL ARE WELCOME. Jim Cipra will present "The Mechanical Art of James Condliff". Trudi Olivetti (emcee), Thomas Smoker (tenor) and Crystal Day VanArtsdalen (mezzo-soprano). Hands" - created especially for this symposium. THE CONFERENCE WAS A TREMENDOUS SUCCESS. PLEASE CHECK BACK FOR AN UPCOMING NEW PAGE, WITH MANY PHOTOS, HIGHLIGHTING THE PRESENTATIONS. 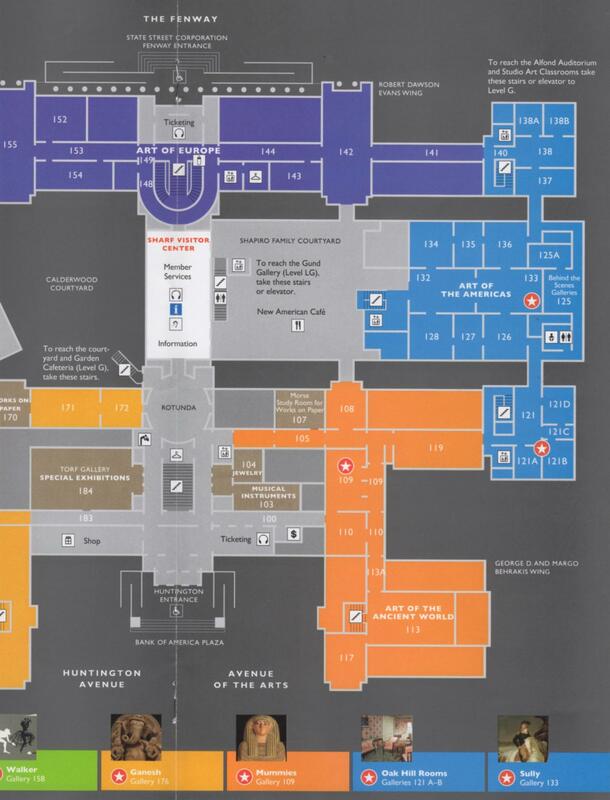 Please consult this MFA first-floor map if necessary. The Huntington Avenue entrance is at the bottom, left of center. The Sharf Visitor Center is straight up from there. The stairs and elevator down to the Alfond Auditorium, Level G of the Art of the Americas wing, are at top right.